Cracksman's stunning victory in the Qipco Champion Stakes has put him in contention for Cartier Horse of the Year consideration, for which public voting opens on Wednesday. 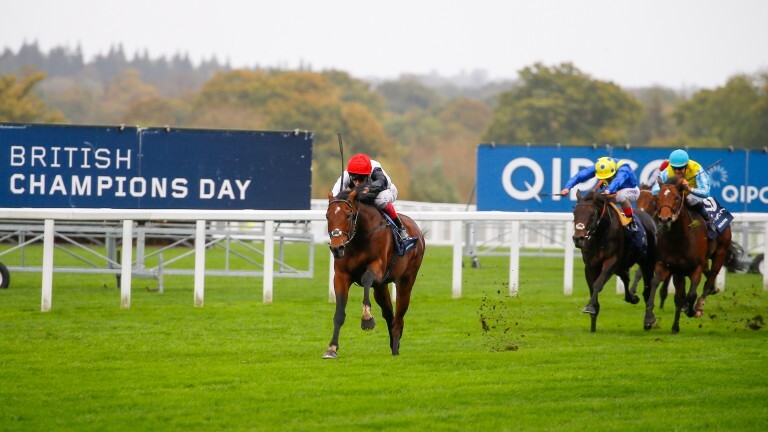 By emulating his sire Frankel in storming to a seven lengths win on Qipco British Champions Day at Ascot, Cracksman has moved onto 108 points and ninth place on the list of leading scorers for the overall award and third among the season's best three-year-old colts. Cracksman has enjoyed a spectacular second half to the season, with excellent Group 2 victories in both the Betway Great Voltigeur Stakes and the Qatar Prix Niel prior to his impressive Ascot success. The colt's trainer and jockey John Gosden and Frankie Dettori are responsible for the outstanding Enable (208 pts), who leads both the Cartier Horse Of The Year and Cartier Three-Year-Old Filly standings following five consecutive Group 1 victories this season, including a brilliant display in the Qatar Prix de l’Arc de Triomphe. Ribchester, second in the Horse of the Year standings, cemented his place at the top of the Older Horse category with second place in the Queen Elizabeth II Stakes while Hydrangea consolidated her hold on fourth place in the Three-Year-Old Filly category with victory in the Qipco British Champions Fillies & Mares Stakes. While the European season is moving to an end, there are international highlights over the coming weeks, including the Breeders’ Cup at Del Mar, USA, on Friday and Saturday week. The awards, which recognise the season's best performers in Europe, are decided by an established combined format of points earned by horses in Pattern races, which make up 30 per cent, the opinions of a panel of racing journalists and handicappers (35 per cent) and votes cast by readers of Racing Post and The Daily Telegraph plus ITV Racing viewers (35%). Public voting, which includes the chance to win a Cartier watch, opens at noon on Wednesday and can be placed online until the poll closes at noon on Tuesday, November 7, following the running of the Group 1 Emirates Melbourne Cup. The 2017 Cartier Racing Awards will be presented at a glittering ceremony before an invited audience of 300 at the Dorchester Hotel, London, England, on the evening of Tuesday, November 14. Harry Herbert, Cartier’s racing consultant, said: "Qipco British Champions Day has firmly established itself as one of the great fixtures in the calendar and this year’s renewal produced truly memorable races. "While the European season is starting to wind down, there are still opportunities for horses to mount a late challenge for honours at the Cartier Racing Awards, with the Breeders’ Cup at Del Mar, California and Melbourne Cup Carnival in Australia on the horizon."